If you fancy broadening your acoustic voice, this Fusion range is one of the best places to start looking. Tidy build. Lovely acoustic tones. Easy transition for steel-stringers. The concept behind the Fusion series is simple enough: to create a nylon-string guitar that feels like a steel-string. Okay, a standard concert classical nylon-string is quite a beast, not least its neck. While a modern steel-string electro might have a 44mm nut width or thereabouts, the classical is typically 50 to 52mm. String spacing is therefore a lot wider, and with a flat fingerboard and often quite flat-backed U-shaped neck, it can feel dramatically different to the more familiar steel-string. "Acoustically, there's a crisp but balanced tonality with a nice touch of 'Spanish' attack"
This Fusion aims to narrow the gap with a 48mm nut width, a cambered ebony fingerboard (406mm/15.98 inches, like a Taylor), and a more comfortable and relatively shallow C-profile neck. Our sample sticks to classical tradition with a 12-fret neck join (a 14-fret is available), side dots like a steel-string, a 640mm (25.2 inches), as opposed to the typical 650mm (25.59 inches) or longer scale, and an extra partial fret for the top two strings. 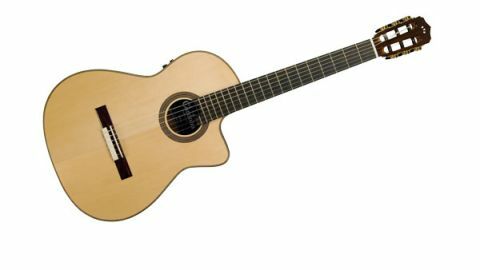 The lighter tension of nylon strings means that the spruce top is not only thinner than a steel's, but braced differently, with a classical-style fan bracing. There's also a classical-style 'slipper' neck joint, although the neck itself, like many modern nylons, has a dual-action truss rod. Build is very tidy, with an almost Maccaferri-style wooden ringed rosette and 'flat' cutaway, full-depth body edged with rosewood, and generously figured maple back and sides. Powering comes from Fishman's under-saddle pickup and Presys blend preamp, which - along with EQ, tuner and feedback-busting phase and notch filter - also features an internal mic than can be blended with the under-saddle. Nylon strings are typically graded in tension, not gauge like steel strings. Be warned, however, when playing non-classical styles, string 'squeak' can be problematic and you might consider sets with polished bass strings. Acoustically, then, there's a crisp but balanced tonality with a nice touch of 'Spanish' attack. The well-installed frets could do with a polish, but overall playability is a lot easier than a conventional classical. Amplified, it's a little over-crisp; reducing the treble EQ helps, but it's easily overdone, resulting in a clichéd 'dull' nylon sound. The internal mic enhances that edge, but introduced more than a smidgen, creates feedback. That said, at cafe volumes, it's easy to get a good 'acoustic' sound. Aside from those frets, this is a well-sorted Spanish-sounding nylon-string that any steel or electric player could adapt to easily. Amplified, it's not as sorted as Yamaha's NTX/NCX guitars, although Cordoba does offer a much wider range of instruments.